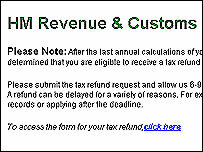 HM Revenue & Customs (HMRC) has warned of a fraud which uses a fake HMRC web site to steal credit card details. Fraudsters have sent out "phishing" emails, purporting to come from an entity called HMRC Premier Services. 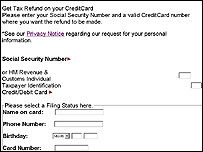 They offer a tax repayment to be paid directly to a debit or credit card - as long as people go to the site and reveal their card numbers. The HMRC warned that the website was bogus, and said it was very concerned about the fraud. A spokesman said it was the first time the organisation had been the target of such a phishing exercise. "We are very worried," he said. "This is a very well thought out and constructed scam," he said. HMRC first became aware of the fraudulent emails earlier this week, but said it had no idea yet if anyone had been fooled or lost any money. "We have had people calling our contact centres asking if this was legitimate or not," said the spokesman. The emails claim that the HMRC has conducted a review of the person's tax affairs and has found that they are due a rebate of £70. They are invited to click on a link in the email which then takes them to a bogus web site, mocked up to look like the front page of the HMRC's own main site. There, they are told to fill in a form which asks for a social security number, tax reference code, name and address, telephone number. Crucially, though, it also asks for details of the person's debit or credit card to which the bogus rebate can be credited. A further click would mean those details would be sent off directly to the fraudsters. The HMRC said it had referred the matter to the police, and was trying to close down the bogus web site which is hosted on a server based in France.